I'm visiting with relatives right now, and having a lovely time. and gave us great instructions on how to use the stamps and punches. We all became engrossed in creating "step" cards in a tan, black and cream color scheme. Lots of fun! Our results were diverse and we had a lot of laughs along the way. in each. At night, with the lights off, the effect is so lovely. and tributes from all. The final page featured one of the family dogs, Bob, the English Bulldog. and a very happy Hanukkah. May you enjoy all of the blessings of the season! Last month I was posting so often for Art Every Day Month. Now I feel like an absentee blogger, as the holidays loom and I'm totally involved in Christmas preparations. But two members of our household are holding it together and going about business as usual! Out on the porch, where it is chilly, Rosie and Angus huddle together and watch all the action in the back yard. The last photo looks like a lovely embrace, but Angus actually has his mouth around Rosie's neck. He likes to let her know who's the boss, but he never really hurts her. I'm working on some ornaments and will post them soon. Meanwhile, hope you've had a great week!! I want to share a special link with you - a blog I love to go to for inspiration, a pick-me-up, or some upbeat common sense. Somehow, whenever I arrive at This Way to Joy, I find just the right words to give me the lift I need. Connie has a way of doing all of this with humor, sparkle and a touch of sophistication. Speaking of joy - 'tis the season! Here's wishing you a wonderful weekend! I received a great surprise in yesterday's mail from my blogging friend Gwen, whom I met during Art Every Day Month!! I had commented on her pen and ink drawing (below) which is also stitched with black thread, and she sent it to me! 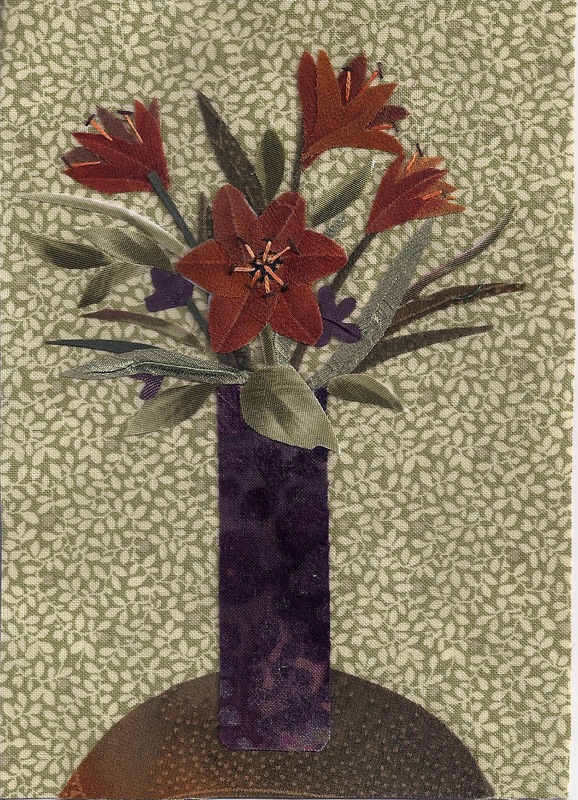 She also included a beautifully collaged card. I was excited to receive mail from England, and I love both pieces of artwork, Gwen!! This weekend, as our town celebrated its annual Holiday Stroll, our newly formed Artists' Collaborative was given the opportunity to have an exhibit of artwork in an unoccupied store. We set to work on Friday, cleaning and decorating a long untended space. Many hands made light work, and the place was transformed by opening time on Saturday! We named it Gallery 39, inspired by the store's street number. The exhibit went from 3 to 7 PM. The main streets were closed off, there was music and food to enjoy, a Hat Parade, musical entertainment and all sorts of events in the town. listened to seasonal music, and had a lovely time! and, all in all, it was a memorable evening! I have not been present every day this month, but I have definitely done more artwork than usual. This has been a lovely opportunity to share artwork, meet new people and see the work of many other creative artists! I'm so happy to have been a part of Art Every Day month!! Thank you, Leah!!! Yesterday we went on a longish ride for a wonderful visit with family. While Bill drove, I entertained myself by drawing in my sketchbook. I was looking at magazine photos for inspiration. I find that, by the time I sketch something, change a few details around, and then translate it into cut paper or fabric, it looks totally different from the original inspiration. Just one way of working - often times I just cut or draw directly from my imagination. Hope you have a pleasant day!! Is it really day 26? As I write the title of this post, I'm amazed at how quickly this month has flown by! My creative juices have been lagging lately, but I want to finish the month on a good note. It's a bit exhilarating to make creativity a priority for each and every day - waking up and thinking, "What shall I make today?". It's a good exercise and can make a creative person realize, I love this. I love the stimulation of my art materials, the flow of ideas, the possibilities! It's a good place to be and I'd love to be there all the time! A little artificial flower arrangement I made for my mantle. The colors make me smile. And a fused fabric background I put together for a soon to be finished picture. Some flowers, some stitching and we'll be on our way! Hope you have a beautiful Saturday! for air and wish everyone a very Happy Thanksgiving!! through which I have met so many wonderful friends. 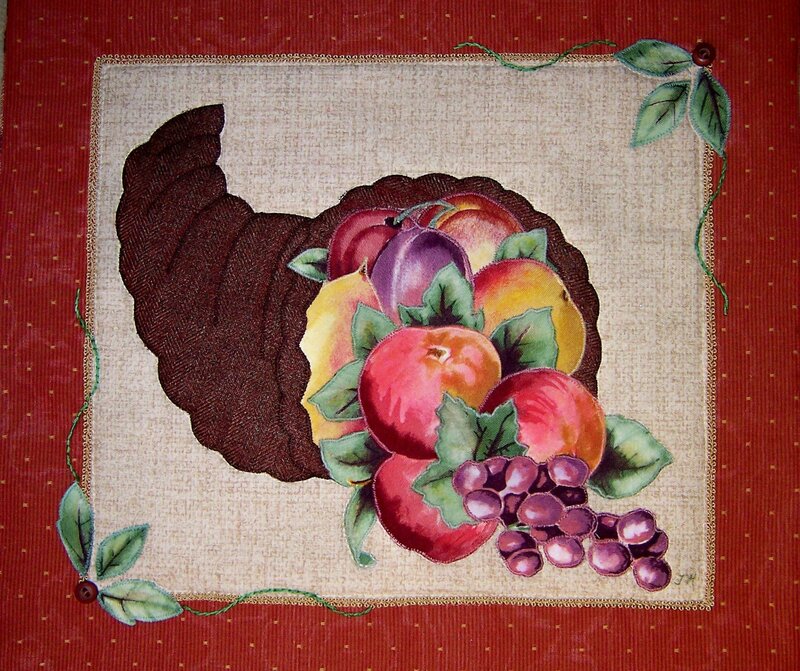 This is a wall hanging I did MANY years ago! I hope to have something new to share very soon! Beautiful Nature ~ always inspiring! 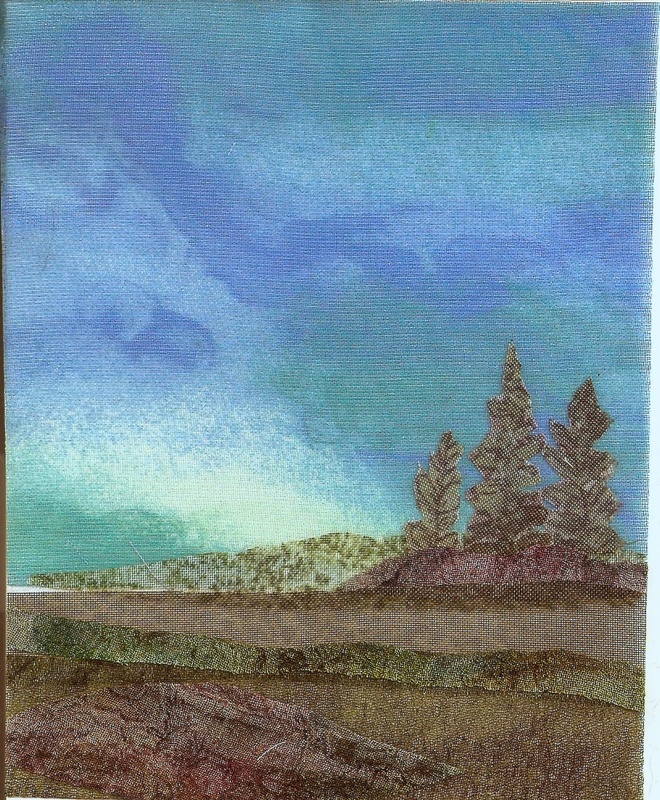 Recently I've been working with sheer fabrics, but this morning I put together this landscape, inspired by some rich colored remnants I came across in a box while cleaning my studio. The sky fabric is hand dyed, but I can't remember where I got it. That's unusual for me, since I usually remember where most of my fabrics came from - even those I acquired 30 years ago!! I love my collection of materials and each one pretty much brings back some kind of memory. I do recall the deep purple nearest the sky was part of a blouse I wore, which became stained. The front fabric was purchased recently and I folded it over a piece of thin batting to balance the textured selvages of the other fabrics. I'm happy with how this piece is coming along. My instinct is to add some trees, but then again, maybe the movement in the sky colors supplies it with enough detail. Hope your day has been a good one! made from my stash of sheer fabrics. Today I found another unfinished piece and decided to complete it. 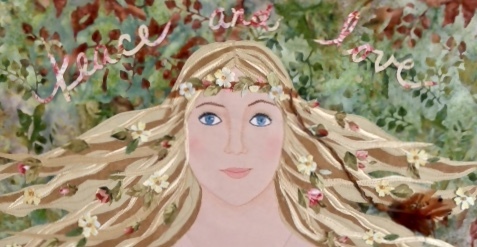 This is an embroidery I had started when I was designing my present blog banner. First off, I determined the size I wanted and printed the words onto some white cotton, freezer paper -backed cotton. I quickly discovered that my current printer does not have an adjustment for paper thickness and I jammed it a couple of times before getting this done. I then drew my kitties with a purple, disappearing ink pen. I'm not that experienced with hand embroidery, although I did it as a little girl and really love the look of it. Instead of using an embroidery hoop, I fused the piece of white cotton onto some thin white flannel, for stability and so that the stitch ends wouldn't show through. (I pretty much make up my own rules when I do things!) I began embroidering and abandoned it at this point. Today I finished embroidering everything but the whiskers. I used pastels, this box of which I've had since high school, and a pointy Q-tip to blend the color. The final step was to add the whiskers. 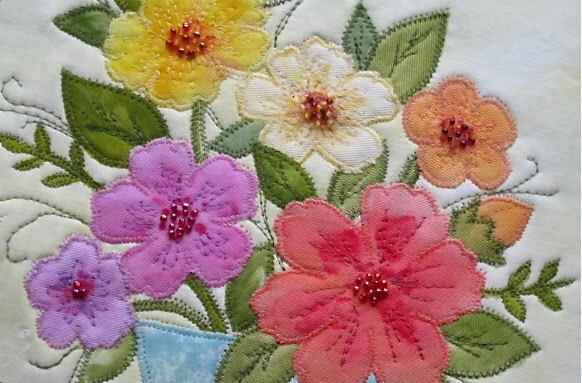 I love the texture of the embroidery, and the softness of the pastels. Now I can add this to my collection of Angus and Rosie art! They are very inspiring subjects!! I'm so happy that it's a beautiful fall day and that I'll soon be going out to visit my sister, and I'm also happy to be a part of AEDM! 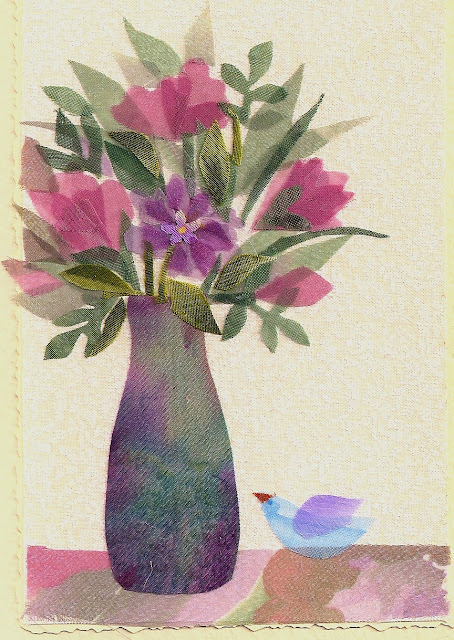 As you can see, I've added leaves, stems and other elements, changed the vase fabric and put in what, I hope, looks like a little glass bird. I feel so good to have finished it - although I may tweak it a little bit more!! I have no new artwork to show today, so I thought I'd share a bit of my day instead. It was a rainy day, but outside my porch this tree looked beautiful against the gray sky! If you've ever read Julia Cameron's The Artist's Way, you know the value of an artist's date - time spent refilling your store of ideas and inspiration. It could be a walk in the woods, a visit through blogland, or a day like the one I had today. Along with a group of like-minded friends, I went on a fabric shopping trip to two great fabric stores. Our first stop was Fabric Place Basement in Natick, MA. Fabric Place had once been a favorite of New England sewing enthusiasts, and we were heart broken when all of its locations closed several years ago. Now the owner has opened this new store, and we are thrilled! There were lots of goodies to look through. I bought some beautiful cotton fabrics that said "landscape" to me and some color saturated sheers which will be ideal for flowers. 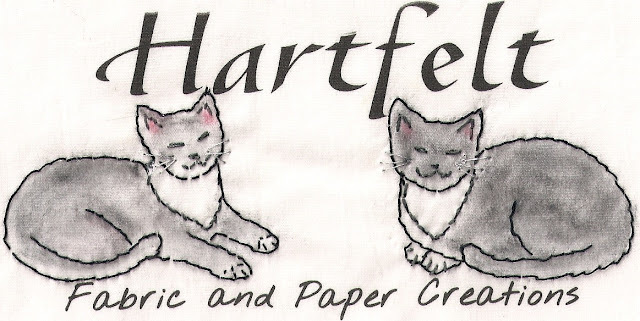 Our next stop, Sewfisticated Fabrics in Framingham, Massachusetts, was another treasure trove in which I found even more gorgeous sheer prints. Being surrounded by a wealth of colors and textures is definitely stimulating to the imagination, and I can't wait to start creating some new work with my newfound materials! I'll show you my finds later! Yesterday I posted a fabric picture of a vase of flowers I had done, and Gwen, of Foxglove Hill, asked me to explain how I did it! So I decided to do a little tutorial of sorts. I started out with a vase template, some sheer and semi-sheer printed fabrics, sharp scissors and a 4"x6" piece of background fabric ( in this case white ) which I fused onto a piece of watercolor paper and then deckle-edge cut the paper around the fabric. For this project I used Wonder-Under fusible web by Pellon to back all fabrics. I held the vase template, under the semi-sheer fabric, up to the light to select the best placement, then traced it on the back and cut it out. I freely cut into the sheer printed fabric, making organic leaf and petal shapes. I like to call these 'fantasy flowers'! Here are the shapes I cut out. I decided to slim down the vase a bit and started pressing petals and leaves, which had been backed with fusible web, in place lightly with a dry iron. I love using sheer fabrics because, when one shape is laid over the other, beautiful shadows are created. I found a different piece of sheer printed fabric with some darker greens and cut stems out of that. This is as far as I got today, and it took one hour and ten minutes. I'm planning to add more details and I'll post the finished piece tomorrow! Hope everyone is enjoying a great day! This fused fabric picture was sitting unfinished on my ironing board. I used some semi-sheer dress fabric for the leaves and flowers, a cotton batik for the vase, and hand embroidered the flower stamens. The finished size is about 3 1/2" x 5 1/2". It feels so good to finish up some of the UFOs around my house - more to come!! Hope everyone has a fabulous day! !